...you'll love the isod mini. While waiting to receive deadly socks to finish or a pair that will finish me, I knit a mini ISOD. 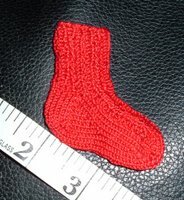 I used some perle cotton and knit up the mini sock using 24 sts. I considered using some #10 crochet cotton, working it over 12 sts, making a pair, and turning them into earrings. I may still do that. I'll turn this one into a pin and attach it to my knitting bag. I could make a bunch and start sending them along in the assassination packages. Hmmm...that's how the dead could still participate. They could knit a bunch of these mini ISOD, and everyone who participates could be sent one as a badge. They are small enough to be sent in a regular letter envelope. I may be onto something here. What do you think? I joined the October Birthday Swap. I’m going to have to take a pass on the next round of SP, but I still wanted to be part of an exchange, and this one is perfect for me. My partner is the new blogger, Stephanie. I have received her questionnaire for the exchange, and my mind is swirling. I have so many ideas for little gifties (and big ones, too). I like to give gifts. This is going to be fun. I look forward to sending a special birthday package to a fellow knitter with whom I share a birthday month. It’s okay, I’m laughing, too. I’m sure it will come as no surprise to any of you to know that in spite of Yarn Monkey’s announcement that all the dossiers had been emailed, I have not received a dossier. Yeah, it’s more than a little bit funny. My original target is incommunicado. I don’t know the reasons, but it is her loss. Sock Wars rocks! She is missing out on tons of fun, and this pair of ISOD. I suppose it’s okay to post a picture of them. Maybe if I get her address, I’ll send them on to her anyway. Because of the little interruption that Hurricane Gordon caused, we had to do our best to figure out how to proceed. We decided to assume that Sarahkat is not participating in the game, so we skipped over her. That made Scarybez my new target. I had already knit a pair of women’s US 8 ISOD. Rather than ripping back the toes and knitting the feet longer to turn that pair into a pair of women’s UK 8, I decided to cast on for a new pair. I like the way these turned out, but I cannot show them to you. As they will cause Scarybez’s death, she gets to see them before the rest of you. That’s right, kids, Aunt Sarah is a Killer! It’s hurry up and wait time again, but I’m not in a hurry. I’m returning to the Pacific Northwest. Okay, so I’m just resuming the knitting of that shawl, but I would love to go back and visit one day. I’m down to the last chart in the body of the shawl, and then it is on to the edging. All’s fair in love and war. War is the h-word. It’s just a game, kids. I confess to keeping the energy high in this international socknitting tournament. Have you been keeping up with what’s going on in the Sock Wars? In truth, it is merely a fun game, and I am not nearly as wrapped up in it as I may seem to be. I’m having fun. I’ve peaked in on several blogs that were new to me. Much time has been spent considering time zones and thinking about other parts of the world. I wonder if I will have an opportunity to visit any of these far-off lands. I’ve tested my internet searching skills. The fact that I have been unsuccessful at acquiring my target’s mailing address proves that I am not the excellent stalker you have believed me to be. I know you are disappointed. The Skanky Knitters have been zinging the emails back and forth. I’m the only one without a mailing address (I have completed a pair of the International Socks of Doom), three have mailed off deadly socks, one more is close, and another has had scheduling and familial conflicts which finally cleared long enough to cast on Monday night. On Sunday I took a break from the battle to complete another chemo cap. I was called out on an emergency heel flap lesson Saturday afternoon. Friday night I set down the deadly socks I was knitting to help fix those of a fellow warrior. She said that what I had done was the knitting equivalent of a soldier leaving safety to bring back a fallen comrade lying on the battlefield. I don’t know about all that, but I was glad to help. 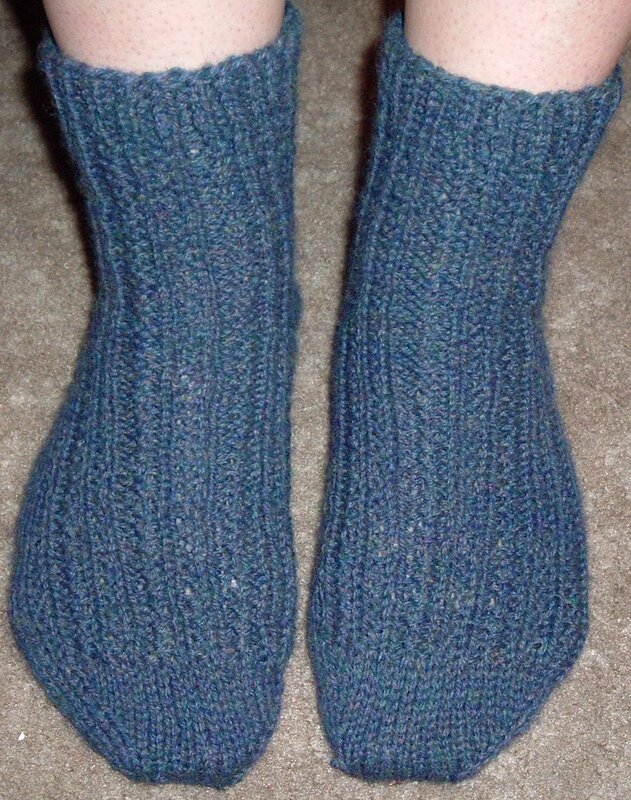 I have really enjoyed assisting my fellow Skanky Knitters with their socks. I am honored to have had a hand in teaching new knitting techniques to other knitters. I signed up for the Sock Wars way back when they were first announced, and I’ve been following the rules. That’s right, I’ve been annoying the daylights out of anyone whom I could force to listen. The upshot of this is that through my constant blabbering and the infectious nature of this event, nearly all of my Monday night s’n’b is participating in this worldwide event. There is a collective frenzy amongst us, although some have been able to maintain cool exteriors. We’ve swatched. We’ve plotted and planned. We’ve agonized and hypothesized. 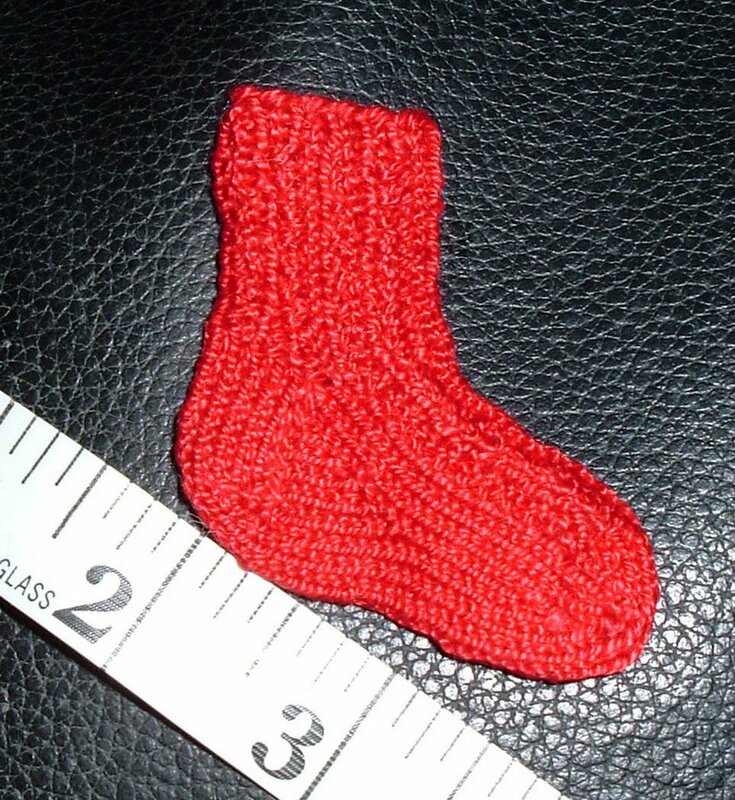 Will 50g/180yards/160 meters of dk yarn really knit a pair of adult-sized socks? Are these going to be decorative socks? Has the whole foot size issue been dropped? Will it be toe-up or top down? There have been ethical dilemmas. Does my yarn have too high of an acrylic content? What if I must kill a friend? How will I care for my family while I’m at war? Why is there an appalling lack of pleasing colors in the yarn in my budget with which I can achieve gauge? Is it right to incorporate Fun Fur or some of that poo-poo brown Bernat Disco that so many of us received for free into the cuffs of the Socks of Doom? I for one will be using Woolease Sportweight yarn. I was roundly abused over on the forum for suggesting this yarn as an economical, widely available (oops, I just looked on their website and see that sportweight is discontinued) option for Sock Wars. Yes, Woolease socks are the foundation for all foot fungi, knitting with it causes carpal tunnel syndrome, and it is the root of loose morals and tooth decay. Puh-leeze! Allow me to let you in on a little factlet. I’ve got gauge, kids, and that is what matters. I’ve also knit more than one comfortable pair of socks with this kind of yarn, and they have held up over the years. That being said, if you don’t want to knit with the Woolease, don’t kill me before I finish the socks. Speaking of the pair of socks you don’t want to have to finish, Monday Night’s Brittany has been able to achieve gauge only with Lion Cotton. Upon plunking the gauge-producing yarn on the table, she exclaimed that she might be the tightest knitter in the land, although there is competition amongst our group for this title with Beth. It would seem that most of the group wants to be able to kill at least one other sock warrior. I’ve only heard one amongst the Monday Night s’n’b Skanky Knit group who views the idea of having to kill another group member as fun. There are talks of public execution. Oh, this is going to be a fun event. Please remind me of this if I’m not listed as a fallen comrade a month from now, or if I am on the list Saturday. I'm staying up all night tonight on pattern watch, and then--knitting. I had hoped to have one last get together with my local sock warriors. Instead, we kept the nephew who isn't feeling well. A 4 1/2 year old boy who is just sick enough to be kept out of daycare makes for a less than fun house. Ah, I love him! I'm just going to have to let him watch Star Wars, Finding Nemo, or whatever else he wants to keep him busy while I'm knitting the International Sock of Doom. It’s not all about socks around here, but before I move on, have you heard about this? Anyway, since the yarn arrived last week, I could begin my preparation in earnest for the knitting of Snowman and Skates for my mom. Armed with a tape measure, I was able to corner her and get the information I need. I still need to swatch. I believe I found an error in the pattern booklet. It’s not a big deal. The supplies list that one needs US size 3 (3.25mm) needles. This size is noted elsewhere in the booklet. However, under the gauge section, it reads 28 sts = 4” using size 1 (2.25mm) needles in stockinette stitch. At any rate, the steeking instructions leave much to be desired. In fact, they basically encourage the knitter to consult knitting reference books or to do an online search for further instructions on performing this scary maneuver. This is fine, because we have the lovable Eunny Jang (have you seen these socks?) to guide us through the steeks. I’ve made a quick read through her guide to the world of steeking. I think I’m going to employ the crochet method. It all remains to be seen. There is still a lot of knitting to be done between now and then. Heck, I haven’t even swatched yet. I also have to decide between embroidery floss and yarn for the snowman details (and doorknobs, too). That’s also one of those decisions that can be left for later. I’ve even considered using beads for some of the finishing bits. Or would that be too much and turn it into one of those horrible holiday vests? Socktoberfest is back. I love knitting socks, so I just had to join the celebration. 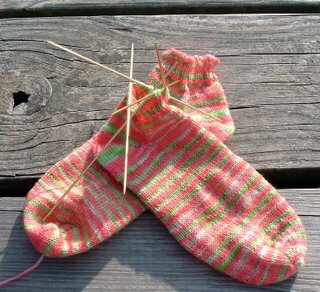 I have so many potential socks running through my mind that they may need darning before I’ve even cast-on for them. I am excited for the beginning of this festival of socks. In the meantime, I’ve moved on to the fish charts for my Pacific Northwest Shawl. I'm on row 161 of the 178 in the body of the shawl. The rows are long, but I'm still enjoying the knitting. I had a heart-stopping moment in the wee hours of Monday. I inadvertently twisted and pulled on the Denise with which I’m knitting the shawl and it became disconnected, letting many stitches free. This is where using a yarn with a significant mohair content really paid off for me. I was able to pick up all the stitches, and all was right with the world. I'm keeping up with my spinning. I think that I would like what is currently on the spindle to become the Swallowtail Shawl (IK Fall 2006). The yardage required for this pattern is relatively little, and I think it would be great to turn something I've spun into such a cute little lacy shawl. This is my spinning goal/dream for now. In fact, I think I'm going to go spin. Hope for the best, but prepare for the worst. Does that quote officially belong to someone? I don’t know. It’s a true one, though. We had an experience last week (I won’t go into details) where we were afraid to hope. At the same time, it was difficult to face the event without allowing some rays of hope to enter our hearts and minds. Perhaps this is what made the disappointing news such a punch in the gut. It really did knock us for a loop. I try to look for some positives, and the best to be said is that it could have been worse. Two days later we learned that this event has given us experience and preparation for a future occurrence that is even more unexpected. I must say that we have probably exceeded the adult recommended daily allowance for a dosage of irony. What is the antidote for an irony overdose? I’m treating liberally with wool and knitting friends. I’m also doing my best to realign my thoughts on these matters toward the positive and perhaps productive. This remains to be seen. There are some things that we cannot change. 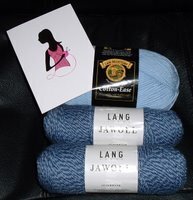 My first order from Knitpicks arrived on Thursday last week. I needed that yarn love. We were on our way to face another unpleasant bit when I saw the postal vehicle pass us. I asked my hubby if he would mind turning around. I just knew my yarn was in that truck. I was being rewarded for facing some unpleasantries with a positive attitude. We pulled up alongside the mailman and I joyfully received the anticipated package. I opened the box and examined each item. Can you believe that they neglected to include a catalog? I was a bit surprised. I have not received a catalog in quite some time. This is just as well, as I have spent my yarn budget for who knows how long. This is also okay, because I do have the stash. Anyway, it was the yarn and pattern for the Seasonal Fair Isle Vests that had me eagerly awaiting this shipment the most. I’ve got to say, Palette feels pretty nice to me. The Essential sock yarn seems like it will be a good, solid, sock yarn. I’m curious to find out how the Dancing sock yarn will knit up, especially because of the 7% elastic content. I also ordered one of their circular knitting needles in US size 0. New knitting needles are an exciting experience. Upon first examination, it seems like it will be good circular needle. I like the tips. The last thing I ordered was the pattern for the Sweet Mary Jane cardigan. I believe that I have the lace yarn for this in the stash. The range of sizes this pattern has been written for is astounding (xs-5xl). I don’t know just when I will get around to knitting this, but it has been on the mental to-knit list since I first saw it. I love to knit lace, and I've wanted to knit myself a cardigan that wouldn't be too heavy. Besides, at $1.99, and the fact that 100% of the sales of this pattern go towards breast cancer research, putting this in the cart was a no-brainer. Lacking only the semi-sweet morsels for chocolate chip cookies, I let my nephew decide which Walmart we would visit on the way home. Of his two options, he chose the one I don’t get to as often. This worked for me, as I wanted to check out the clearance sections. I set him to the task of remembering our chocolate chips while I headed towards the yarn. They are making some changes, amongst which is the decision to carry Lion Wool. At any rate, this means that shelf space must be cleared to make room for the new stock. Clearance yarns of interest to me include Cotton Tots and some colors of Moonlight Mohair. My nephew is four and one-half. He was introduced to my obsession at a very early age. One of his first complete sentences was, “Don’t look at your knitting. Look at me.” Needless to say, he has petted yarn with me. When I caress the yarn, I often touch it to my cheek. The little man has taken to this habit. As an even littler man, I had to watch that he was not passing the yarn across his slobbery, baby mouth. I am glad that he has progressed past this stage. When I handed him a ball of blue Cotton Tots to pet, he felt it with his little fingers, stroked it on his cheek, and then he sniffed it. It seems that I have passed on another yarn investigation trait to my nephew. I don’t think he has ever seen me sniff yarn. Somehow, he has just happened upon the practice. I can tell that he feels it to be important in the process of evaluating a new yarn, and I agree. I was eager for my mail week to begin. I suffered through Monday. I knew that I had yarn coming to me. For one thing, I made my first order to Knitpicks last week. As if this weren't reason enough to wait on the mail carrier, there was more. Becky queried those who donated hats last round for a preferred shade of Cotton Ease. I'm pretty easy to please, so I left the choice to her. She sent me a lovely ball in Ice Blue. If I didn't already have a chemo cap on the needles, I would cast-on with this. It came in the cutest little plastic bag with sheep all over it. There were also two skeins of blue Lang Jawoll sock yarn wrapped in some lovely pink tissue paper. I won those in a contest to help choose contest ideas. To top it off, she enclosed a nice note on a cute knit-themed card. These are both new yarns for me. I look forward to knitting with them. It really made my day. Thank you, Becky! I especially needed this boost after checking the status of my Knitpicks order. I made sure that everything was in stock before I submitted it. I kept reading that it was being processed. Impatiently, I pored over the site for an answer. I continually read that most in-stock orders are processed and shipped within 24 hours. I placed the order on Friday, and when it hadn't shipped on Tuesday, I began to wonder. The same message that my order was being processed greeted me each time I checked (no less than ten times) on Wednesday. Finally, when I accessed the site one last time before leaving the house today, I was pleased to read that the order had shipped yesterday. Woohoo! Now the waiting can begin anew. I wouldn't say that I'm being impatient, I'm just really looking forward to beginning a present for my mom. Also, after telling my grandmother about my order, she is most interested in my opinion of their needles, as I ordered one. I do not aim to enter the battle unprepared. There is the physical preparation. Appropriately sized needles are cleared. I’ve trained with the magic cast-on and it now is a weapon in my growing arsenal. I can graft the tops of toe-up socks without looking at my directions. Oh, but my nerves! You have suspected that this could be my downfall. So I have done what I must to steel myself for the upcoming pressures. Children, the gaps betwixt the boards were frighteningly wide. I do believe they were further apart each time a needle was cleared of stitches and was in mortal peril of being dropped and rolling away, down, down, into the depths of the lake. I called upon inner reserves of strength, steadied my hands, and finished the sock. I now have a pair of Seedless Watermelon footies. My knitting put itself on the line for me that day. It helped me get through a day that we have not figured out, yet. What with all the preparatory training, you know I had to do something to jinx myself a bit. I've already created and decorated the mailer which will carry the Sock Wars socks to their target. Yes, this assumes that I will kill before I am killed. I would show a picture of the packaging, but I want it to be a surprise for dying. That's right, my unknown one, you are already dying. I shall slay you. Time to get off this roller coaster, for now. Here’s an FO from my first unplanned-it’s-on-clearance-I’ve-wanted-to-try-this-yarn-impulse-purchase of the year. Last year I knit one of these for my mom to keep her ears warm. She doesn’t wear hats because they mess up her hair. Still, she needs to keep her ears covered because a cold wind blowing will give her an earache if they are left bare. She has a horrible, faded pair of earmuffs hanging from the rearview mirror of her car. I thought this could be a good alternative. I don’t know if she uses it. Anyway, I keep my hair back with store-bought, stretchy, knit headbands all the time. I thought that I would like to knit one for myself, and this yarn seemed like the perfect match. Whatcha think? It’s not so easy to get a good picture, so please bear with me. The yarn is Sinfonia. It is 100% mercerized cotton. I should still have enough leftover to knit a chemo cap. I think Shedir would be so striking with this yarn and color. Speaking of Shedir, a picture of one that I knit now graces the Caps for a Cure homepage. I am so honored. Our group is growing and we are knitting and donating so many chemo caps. Well, you’ve seen the headband, I’ve given another chemo cap plug, and you’re wondering what else is on my mind. It’s stalking, I think. Ah, but that has such a negative connotation to it. The truth is, I want to send a surprise prize to another blogger. A lack of some basic facts is keeping me from being able to send the package. So, how do you go about getting the mailing address of a fellow blogger without her knowledge? In many ways, we are strangers. It just isn’t the best idea to publicly post our full names and contact information. We’ve got to think safety. So, if I were to ask someone whom I think has the details I need, should/would she give me this other blogger’s snail mail address? You see, that’s my plan. I know she has previously participated in swaps. I was thinking of contacting one of her past swap partners or hostesses and asking for the information. It could work. I just have to not come across as the type of person who should not be trusted with personal contact information. Hmmm…giving the appearance of a normal person is not exactly one of my strengths, but I’m going to give it a try. If all else fails, I will have to let go of the idea that it will be a surprise, and just ask the blogger in question.